In his book Theater of the Oppressed, the playwright Augusto Boal characterizes the history of the aesthetics of theater as a series of aesthetic techniques that were alternately progressive, expressing the freedom of the insurgent revolutionary social class, and reactionary, being used repressively by that social class once it had become dominant to help to secure the new status quo and quell any further social unrest. First theater was the free singing and dancing of people, Bacchanalian revel, or pure paideia, as we might say if we were nerds who studied games. But nothing can ever be completely free: everything in reality is limited in one way or another, and it just depends on who gets to decide what those limits are. In a hierarchical society, the people at the top generally decide on the limits for those at the bottom. So the chorus was introduced to the theater to represent the expression of the people, but it was used to express what a people obedient to the state ought to express. Then a protagonist separated himself off from the chorus, which was a great leap into individual freedom, but the protagonist would nevertheless have to be a great man, in other words an aristocrat, and if he were shown to be free in any way that threatened the state, Aristotle’s aesthetics of tragedy would ensure he would be punished for his freedom; his freedom would thereby be turned into a tool for social control, because while the audience would be made to empathize with the protagonist throughout the play so that they could vicariously enjoy his vices, as in a kind of videogame escape fantasy, they would in the end be purged of acting on any of these vices in real life once they saw the punishment undergone by the protagonist. Much later in history, the protagonist would be able to decide his own fate, but only insofar as he represented the shrewdness of the dominant point of view of the bourgeoisie, whose ultimate value was money and whose principle of action was how best to exploit others in order to make money. Then it wasn’t until the beginning of the preceding century that the playwright Bertolt Brecht freed the actor from the protagonist, advocating for an aesthetic technique in which the actor would distance themselves from the events of the play and express a critical attitude from the point of view of the working class. Brecht treated the spectators not as vehicles for empathy but rather as free-thinking individuals who could, following the example of the actor, maintain a critical distance. If they were not fully immersed in the play, they could reason about the injustices being represented and come out of the theater not calm and complacent citizens purged of their vices, as Aristotle wanted, but rather ready to immerse themselves again in their reality, and furthermore inspired to act to change the injustices about which they had learned. 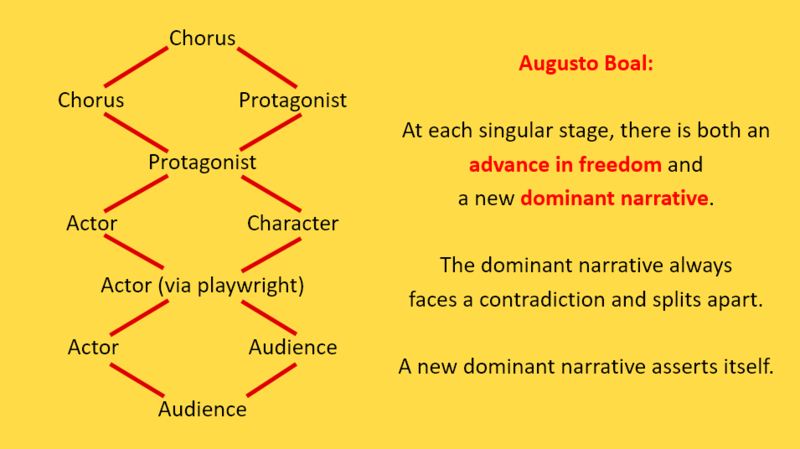 But Boal points out that there is still a hierarchical relationship here, with the dominant ideas of the playwright or poet being expressed through the actor, and while this technique treats the audience as free thinking and inspires them to take action after the play is over, they remain passive during the play itself. The theater had freed the protagonist and the actor and used each of these as tools, at times for progressive and at others for reactionary ends. Finally, Boal says, it had to free the audience, so that plays could be used directly as rehearsal for revolution. In other words, Boal argued that theater, finally freed, is politically efficacious interactive theater, or games. Tragedy imitates the actions of man’s rational soul, his passions turned into habits, in his search for happiness, which consists in virtuous behavior, remote from the extremes, whose supreme good is justice and whose maximum expression is the Constitution. The protagonist, the great man, the aristocrat is shown to be fully responsible for the actions that lead to his downfall. He is shown to be virtuous except for a single flaw, and the flaw is not some mere error that occurs spontaneously and all of a sudden, but rather a habit that he is fully responsible for having developed over time. In this way change is both represented and shot down. When they see the tragedy that the great man leads himself into due to his bad habit, the spectator will realize that they should get ahold of their own bad habits and step in line with the orderly society prescribed by the law. For Aristotle, a good habit is that which is good for maintaining the status quo of society. In fact, he defines virtue as achievement in habit of the average and avoidance of the extremes—what we might call centrism today, that which is, at best, politically ineffectual and, at worst, deliberate obfuscation of a scheme to preserve the way things are. I want to suggest, however, that Aristotle’s general conception of habits actually isn’t wrong at all, and that if we steal it from him, it can be put toward progressive rather than reactionary ends. It seems obviously true that we all have beliefs and habits and that we are never just acting, just sending a completely free action out of nowhere into the world, but rather always acting from our beliefs or habits, whether consciously or unconsciously. And these beliefs or habits each represent a field of possible actions, possible because they appear possible to us. The real choice that we have is whether we are conscious of our habits, and if we are conscious of them, then we can get control over them, choose them, change them; they become our commitments. By becoming conscious of our commitments, we can begin to change the actions open to us. Whereas Aristotle’s aesthetics emphasizes the development of what he considered bad habit in order to represent change in an individual and shoot it down, we can see how, on a collective level, it would be helpful to develop our ability to make what we might consider good commitments, the commitments that are necessary to get control over the actions we can take for collective change. What does this mean for art and artists today, in 2018, when we are all expected to be self-responsible individuals who take care of our financial and our mental health problems, without recourse to our communities? How does art help to convey this dominant ideology? What are videogames, which in the main paint the picture of the atomized individual sitting alone in their room in front of a computer or TV screen, and are in this way perhaps the paradigmatic artistic medium of neoliberalism? Instead of tragedy, many videogames are escape fantasy or power fantasy, but the principle—and ultimate effect—of the immersion and empathy involved is the same. It serves to quell rather than to inspire change in thought or action. This is exemplified by the trope that I like to call the fatalistic plot twist, which demonstrates that there is no possibility of choice. 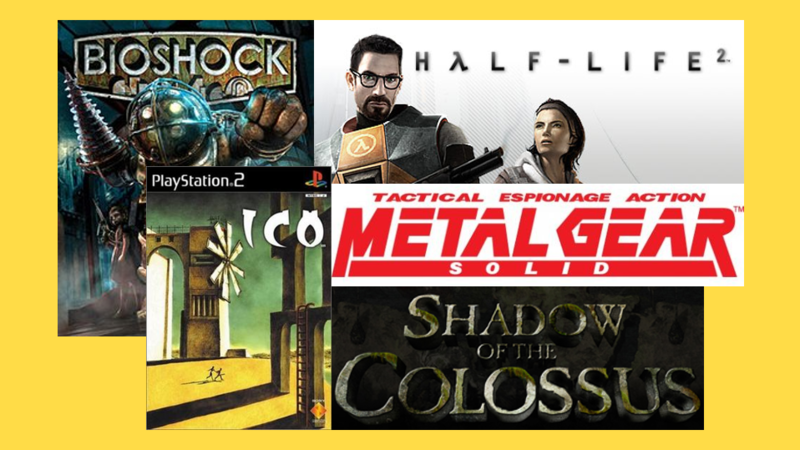 In all of these games, the player is on the one hand asked to suspend their disbelief throughout regarding the fundamental linearity of the game in order to enjoy the escape fantasy. On the other hand, there is a twist at the end that justifies the linearity, apologizes for its presence in what ought to be an interactive medium, by showing how the protagonist was manipulated into doing everything they had thought they were doing out of their own free will. These games all bring a shattering end to the escape fantasy that they begin with; they even imply—or sometimes are quite explicit about—how this is taking place on the meta level: the antagonist is easily readable as the game designer themselves, while the one they were manipulating was you, the player. With this aesthetic that not only makes out the idea of having choice to be a joke, but in the end lets you in on it, it’s almost as though, whereas Aristotle’s prescriptions for art assumed that there was a real threat of rebellion that had to be repressed, art today makes the assumption that there is no such threat. The only really bad habit contrary to the society the dominant class wants to maintain, and whose repression is aided in the realm of art, is the habit of thinking that you might have a choice over anything at all. The society the dominant class wants to maintain is secure as long as everyone has drawn into themselves and does not realize that they have the choice to take action by organizing with others. But this individualism that is characteristic of our times is reflected not just in the art that is consumed but also in the dominant idea of art production as free self-expression. This is an empty idea on its own, if we say that just being able to express oneself, no matter how, is a virtue, without any consideration for the conditions on expression that always exist. It is an empty idea on its own because it purports that we could have the freedom to express ourselves isolated from the social reality in which we are immersed. But there is no such thing as a truly empty idea; every idea comes from somewhere; really, it is a misleading idea, hiding behind it what is the perfect idea of art for neoliberalism. The idea of self-expression, the expression that springs forth from a lone, supposedly free individual, isolates art from the social reality. By doing so, it prevents us from imagining how we might actually express our freedom by first committing to a collective political project, and allowing that project to guide our expression. The need for a commitment to a collective project is suggested by Boal’s history of theater. Boal recognizes the social function that art always has, and in doing so he goes beyond our particular circumstances, beyond the merely historically contingent idea of art as absolutely free self-expression that is today mistaken for universal. It gets past the form of art as isolated, a form in which even art intended as radical and political is unable to effectively or meaningfully engage with society or to avoid packaging into a commodity. And most importantly, the view of art that emphasizes its social function is a useful view of art, because we can use it for progressive ends if we only realize our power to do so. It is clear that art viewed as essentially having a social function is not reconcilable with the idea of art that begins from absolutely free individual self-expression. A commitment to a collective project necessarily involves placing limits on permissible expression—only some expression will fulfill the commitment outlined at the start. We can and should, of course, allow for any commitment to grow and change over time with new discoveries about injustices in the world as well as about the effectiveness of the aesthetic techniques tried out as a means of educating people on those injustices, but a commitment nevertheless always has to be there from the beginning. But how could we possibly decide what this commitment should be? We can only start from our current beliefs about how the world ought to be, beliefs that trace their development originally to the intersection of the various vectors of our social and economic identities. What this will certainly mean is that the art that follows from the commitment will not and cannot be effective for everyone. Brecht acknowledged that his plays would only appeal to the working class, while bourgeois audiences would either respond negatively or simply not understand them. But the social function of politically effective art will be fulfilled today if it overcomes the isolation of individuals that has become characteristic of our reality, and if by bringing together people who share in common aspects of their identities, it helps them to realize their shared interests, and most importantly allows them to explore the practical actions they can take to change reality in order to make it more like the world that the art has committed itself to arguing for. It’s about time for a concrete example. Different mediums will have different advantages and disadvantages as potential progressive political tools. 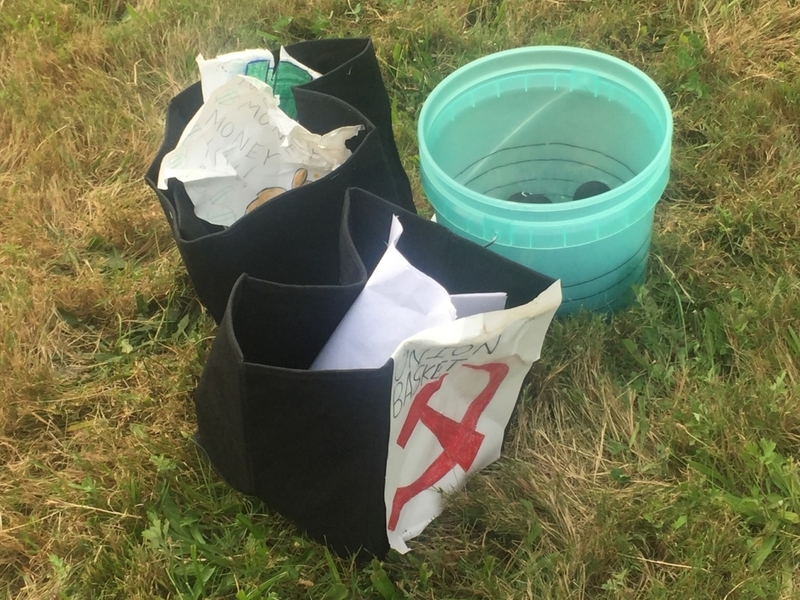 Interactive theater and analog or physical games are particularly good tools not only for picturing possibilities regarding how the world might be, but also for letting participants or players directly explore how to realize those possibilities themselves. This is because interactive theater and analog games are largely governed by merely normative rules, rules that one ought to follow in order to participate or play correctly but which can always be broken. This is unlike digital games, which are bound more by the descriptive, unbreakable laws of computer code. The process of getting players to explore possibilities in analog games is just a matter of encouraging them to break the rules. Boss Battle is an analog game I made—I like to call it a new Marxist roleplaying sport—in which the workers collect balls that represent oil and pass them to each other in assembly lines to get them into a bucket, while the boss watches them and then decides how much gold to pay them after each financial quarter based on their performance. But that’s just what happens on the surface. 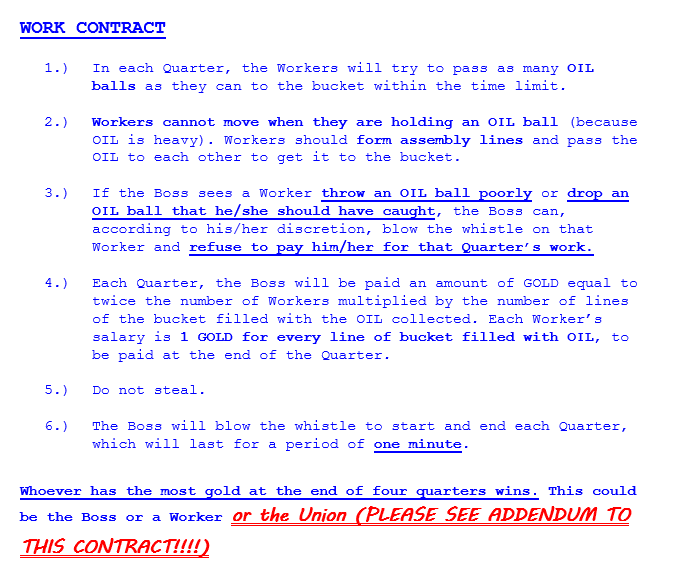 Everyone gets a work contract at the start laying out the rules, but the boss gets an addendum to the contract from the company’s shareholders, while the workers get an addendum from the union. And the union is telling the workers, if they feel they’re not being paid fairly for their work, to steal gold from the boss’s bank account while the boss isn’t looking. Workers can then choose whether to pocket the gold for themselves or donate it to the union. And it’s amazing to see what happens when you hand something as simple as this off to people and just imply that the rules are merely normative and breakable. It’s basically all that you need for people to begin the process of working through the intended argument of the game themselves. 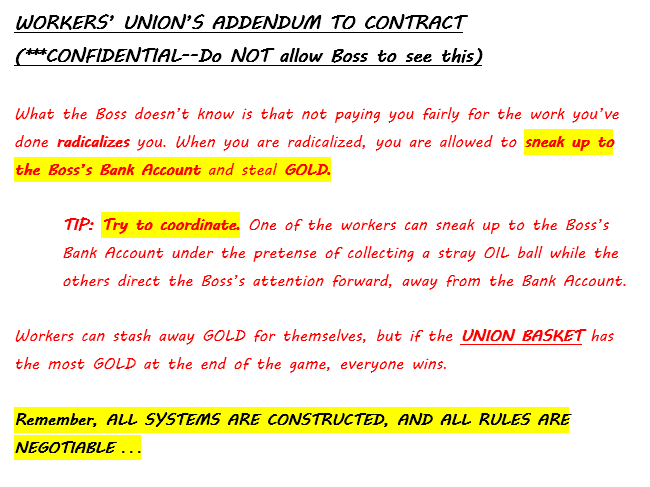 The boss will earn more gold than he is paying the workers, and the workers will begin to negotiate for fairer rules. When negotiation alone doesn’t work, the workers realize that they have to take action directly by going on strike, even though striking isn’t mentioned in the rules at all. Not every individual worker participates in what benefits everyone—some fill their pockets with gold to keep for themselves, and some steal not only from the boss but also from the union. Sometimes bosses realize that they’re being stolen from, and a worker will gladly betray the others by offering to become a security guard just to take a slightly higher wage. But the argument is nonetheless almost always effective, because the game is rigged in favor of a collective solution—because this is what I wanted players to learn to seek out. Although the argument works through the players breaking normative rules, the physical strength in the number of the workers is perhaps the primary support for the argument and what allows the normative rules to be broken and reshaped most radically: it is a descriptive fact of the game that the workers, due to their physically greater strength in numbers, can, if they work together, fight back to get what they are owed and take action collectively for justice. All of the rest of the events of the game, tossing balls and negotiating rules with the boss and so on, is just part of the necessary process of going through the argument themselves and coming to realize this fact that was true all along and just had to be put it into action—and, in fact, in almost every game I have run, players do eventually figure out that they can break the game completely and bring an end to it if they just make a run on the boss’s bank account together, or physically restrain the boss in order to steal all the gold. As I mentioned, art that makes political commitments won’t be effective for everyone, and the point of making it isn’t to change the minds of people who benefit from the way things are—trying to change the minds of business owners about how their workers need a union, for example, would almost certainly be a waste of time. People will bring to an experience like this the ideas that they already have about work and politics, and the argument won’t be effective on them if it opposes their interests. But if they agree with the argument, and if they see that others do as well, and if they learn to work together with them, then it will be a forum for them to sharpen their thought and their action. It will be a success if it can bring together a community of people and help them to recognize their shared interests and, most importantly, to explore the practical actions they might take outside of the game to change the social reality that currently keeps them isolated, together. Prince of Persia: The Sands of Time is as committed to the continuity of a linear experience of space and time as Half-Life or Portal, even though you can see the future at save points, are shown elaborate cinematic fly-throughs of environments when you enter them, and can rewind time. That’s not only because all of these events occur predictably and repetitively (at save points, entryways, mistakes) but also because they ultimately revolve around the moment-to-moment flow of the platforming: you are rewarded for having paid attention to them when you return to platforming, since they give you hints as to how it is supposed to happen (or in the case of rewinding time, how it is not supposed to happen). In the context of the narrative, as the prince’s narration often reminds you, everything you are doing has already happened, which situates history and storytelling as deterministic. But because the feeling is of being constantly pulled back to the present rather than the past, play is experienced as consciousness that is continuous and lived. Most modern mainstream videogames are about escapism. You feel as if you have enormous freedom, the challenges are easily completed and the rewards great, and the world revolves around you, the player. Alternatively, the game is very difficult, and it is a struggle but still you attain mastery, which is equally or even more satisfying to your ego. This is superficial freedom, both lacking an analogue in the real world and not even true in the context of these games, which are after all hard-coded, designed objects. The illusion of agency that is created for open-world games is obvious (and these have, among AAA games, unsurprisingly displaced linear narrative games in the last decade or so), but linear narrative games have also always focused on generating this illusion. Even Portal, among the most coherent of linear narrative games—a game whose story seems to have been designed around the inherent limitations of its form (a linear puzzle game)—turns out to be a (literal) escapist fantasy. It’s more believable than many others because it’s justified by the narrative, but the escape of the second half is just as linear and constructed as the first half in spite of what the narrative may pretend and thus fantasy. It mirrors the usual structure of linear narrative games where the player is weak at the start but grows in power by obtaining upgrades and getting better at the game over time. Some linear games invert this structure and justify the combination of linearity and the illusion of free choice using a common trope of a “clever” plot twist that is placed at the very end (Bioshock, Half-Life 2, the Metal Gear Solid series, even Ico and Shadow of the Colossus, among many others). The player is asked to suspend their disbelief about the game’s fundamental linearity throughout in order to experience a power fantasy (usually with some foreshadowing that it’s all false) before the rug is pulled out from underneath them—showing, on a plot level, that they’ve been manipulated into doing everything they thought they were doing, but also, on a meta level, de-suspending their disbelief by saying that this game was an artificial construction (in which case Andrew Ryan, the G-Man, the Patriots, etc. are stand-ins for the game designer). What makes the twist seem fatuous is that the power fantasy remains dominant until the very end, which makes you wonder why you needed to play all of that first just to get the “real” point. But this is also a somewhat uncharitable characterization in some cases: Metal Gear Solid, for example, has constant points of tension between choice and determinism throughout. What is the purpose of all those cutscenes other than to constantly interrupt the player’s fantasy of playing out the role of an action hero and show that they are not the one who is really in control here? So I’ve realized from this discussion that there’s another kind of player agency experience that I also want to explore. […] Specifically: the situation where you have limited but not zero power. This is, I think, the reality of democracy. I am morally responsible for the actions of my government and for the oppressive social systems I belong to. I did not design them, but I have not dismantled them. It is, of course, impossible that I could dismantle them singlehandedly. In fact, it’s unlikely that I will ever make any visible difference. To the extent that that there are obviously effective ways for one person to change a large system, most involve extremely violent or disruptive actions that would be a net negative. Nonetheless, the difficulty of making a difference does not remove the responsibility to try to improve both the immediate situation of the marginalized and the system itself. Corrypt, in my mind, conveys an experience truer to this reality than many others: it grants you freedom only to show its limits in a world that is ultimately determined by its game designer and the code underlying it. The experience is of a more sustained, more complicated, more honest mediation of freedom and determinism than that provided by the plot twist trope. VESPER.5, another game by Michael Brough, could be described as being about coping with what you don’t have control over by bringing a meditative ritual to it. In her essay on The Witness (only the most recent game to use the plot twist trope), Liz Ryerson writes about Corrypt and Starseed Pilgrim, “The tragedy is that these two games, and others like them, feel more self-contained and well-realized than many of the more widely celebrated games in the culture. They hint at the computer as a strange, distinct new organism — not something that should or really can be tamed.” Computer programs are by nature determinate universes: their possibilities have already been spelled out by the code that is there. But it’s only when you are confronted with this fact, not handed the illusion of escape, that you start to see, in the pressure points in the space between you and the game—while writing poems in Kentucky Route Zero maybe, choosing among only a few choices but feeling each reverberate in your head in infinite ways—any of the real possibilities that exist outside these universes. Is this a consequence of expecting the Truth from our fictional works? It is occurring during the act of interpretation, right? So it’s readers bringing to bear a way of understanding from the culture they’re in – a lack of comprehension of abstract narrative devices, an expectation of the real thing, straight-up – which comes from being immersed in fictions that suggest they *are* the real thing: tv (especially “reality”), movies, photography, – and also from living in a reality that itself contains so many fictions (simulacra) – there’s so little anymore to grasp that is definitively real, so people invent their reality, naturally. It’s a dearth of truth producing tons of false ideological truths. From the perspective of TBG: yes, of course this and similar pieces of media that present themselves as ambiguously truthful are playing with the culture’s current confusion about truth. But this is *clever*, this is where people should bring their understanding of irony to bear. And IF it is based on real events, it is still so much mediated as a work of art that reading any real-world events into it that are of ethical relevance (like that the content is really stolen) is foolish. And understanding this doesnt even take an understanding of this particular author’s intent – it’s just how all creation happens! This, in fact, is where death of the author *should* come in – the context of the author possibly basing this story on reality lends itself to misinterpretations. Forget this – i.e. kill the author – and you can minimally understand it as a work of fiction, *as it truly is*. Interpretations from there may be multiple and varied and you’ll have the issues that you get with opening things up by killing the author, but at least we have a common perception of the reality of the work that is not patently wrong. Keep an understanding of it as fiction and then interpret based on the real context of the culture it’s produced in (one where truth is muddled), *not* the invented context of the author’s life, and we can all come to a better critical community – diverse as well as productive of valuable meaning. The history of games is now the history of videogames, as in these inelegant, strange, and often even monstrous things that took shape over the past fifty years. The aesthetics of triple-A games were molded by corporations and material circumstances—limitations of technology, capital, and profitability. It doesn’t matter whether we now find the forms of triple-A games that arose acceptable or unacceptable, moral or immoral, appropriate and befitting to the ideal of what we imagine “games” to essentially be or not. The only thing that matters is that triple-A aesthetics now make up the history of the medium.